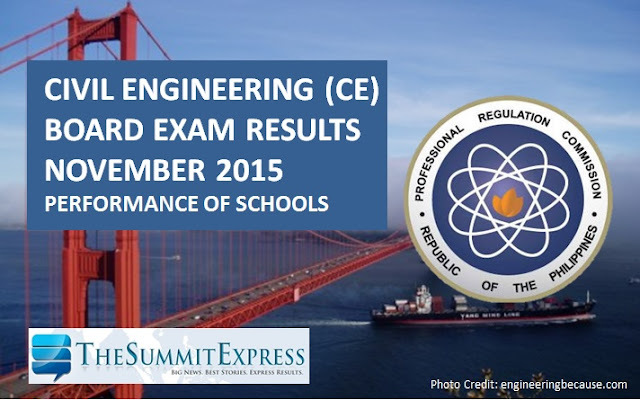 The Professional Regulation Commission (PRC) officially announced on Tuesday, November 24 that 3,935 out of 9,482 (41.50%) passed the Civil Engineer (CE) board exam given by the Board of Civil Engineering in the cities of Manila, Baguio, Cagayan de Oro, Cebu, Davao, Iloilo, Legazpi, Lucena and Tacloban this November 2015. According to PRC Resolution No. 2010-547 series of 2010, University of the Philippines- Los Baños (UPLB), University of the Philippines- Diliman (UP-D) and Technological University of the Philippines-Manila (TUP-M) are the top performing schools with 96.61%, 89.89% and 84.42% passing rate respectively.